What Is Your Medical Association’s CME Technology Strategy? If you don’t have one, don’t panic. You are not alone. Read on to find out how a strategic CME technology plan can help address current “pain points” and prevent future problems. Are you part of a medical association using technology to deliver continuing medical education (CME) activities? If so, we would like to share some of the common pitfalls and problematic scenarios we encounter when we begin our client partnerships. Associations offering continuing medication education use a varied set of technology tools to manage their CME enterprise. Often each one of these tools were developed to address a specific activity’s requirements. However, while these technologies may initially be successful, the growth of the CME program and ongoing changes in regulatory requirements typically outpace the capacity and functionality of these applications resulting in a number of challenges. Unlike other association departments, the CME department is often left to rely on technologies that are: homegrown, proprietary with expensive licensing, or cobbled together from a set of non-CME specific applications. Each creates a subset of smaller challenges. Sophisticated homegrown CME applications requires an association’s software development and IT department to be able to handle the duties of a mature software development shop: systems analysis, budget planning, documentation, development, quality assurance, application management, scalability and sustainability. Addressing these needs requires a lot of resources. And, unfortunately when IT resources are distributed, the Office of CME is often the last on the list of priorities. Per-user license fees can take a toll on budgets and the budgeting process. Vendors may be unwilling or unable to integrate tools with an AMS and other critical applications. The user experience may suffer as interface styles sometimes clash or may not be able to offer a “seamless” experience. Features added by one vendor cannot be shared with other vendors so they may have to be built twice. User data may be stored in different formats and may be incomplete or duplicated across systems. “One-off” custom-built applications do not benefit from regularly released new features. The most common scenario, the DIY CME Program is put together by resourceful education staff on a mission to solve a problem. It is not uncommon for some associations, even very large organizations with mature processes, to use tools such as Survey Monkey, Excel and email to collect evaluations and issue credit and certificates. CME activities cobbled together from such a set of tools can make the user experience difficult, if not impossible, to do well. Data updates to the AMS have to be done manually. Outcomes reporting for accreditation has to be done manually. And within a large or very active CME organization, the amount of work needed to manage programs like this can soon become overwhelming and expensive. Enterprise-wide reporting is usually impossible. Labor and licensing costs are higher than they should be. Education and IT staff are frustrated. Why is Your CME Technology Strategy Such a Mess? There is a hole in the marketplace. No off-the-shelf solution exists to integrate AMS/CRM systems with CME needs. The market is too small. There is no SAP, Oracle or PeopleSoft for CME. No single software application exists that will solve all of CME enterprise’s technology challenges. We don’t offer one either. 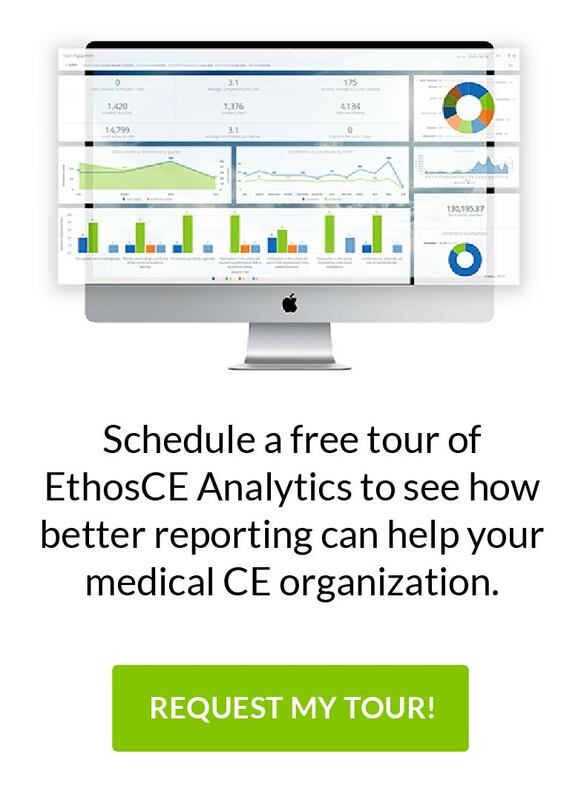 EthosCE is an enterrprise-level open source learning management system for CME It is not a membership management tool or a meeting management system. It is, however, designed to integrate and leverage these existing systems within your organization. Identify a single master database for all your user data and your users’ CME data. This will typically be your AMS system. Do not allow data to be stored anywhere if it is not also put in your master database. Insist that your IT department or AMS vendor builds or provides web services that allow CME applications to read, insert and update user records. Insist that all your CME applications and vendors use a web service to read, insert and update user records. If it can’t share the data it collects, find another solution. Buy or build a CME-centric learning management system that follows the 3 rules above. Look for a system that is open, modular and allows for modules to be added as needed. Use the LMS as a master catalog and entry point for your programs. Please Note: We do not necessarily recommend limiting technology to a single platform. Rather, we focus on data exchanges and modular tools that can leverage the “best in class” features across different applications. Once you’ve created the plan, share it with your staff and vendors. Include plans for CME data storage and transmission, user experience and reporting. You will need to consult with IT, marketing and education departments and other stakeholders. Deliver a unified, seamless user experience for registration, single-sign-on, search, e-commerce, enrollment and reporting. Allow users to view, search and print credits in a single place. Reduce manual labor costs around pulling data and meeting reporting compliance requirements. Reduce the overall number of different CME technology applications that must be maintained or licensed. Allow for predictable budgets not based on license fees. Remove vendor “lock-in” and allow for internal IT staff to build modular CME applications as plug-ins. The problems that exist in an enterprise-level CME association often result from a rapidly changing regulatory environment, a growing need for different types of education, and a lack of resources and time to implement a technology strategy for CME. Given that, we understand why CME enterprises do not have a technology strategy, however, there is no reason for not starting one now. Get started started or give us a call if you need help.